29 Jun Post by Jordan Young Filed under Most Popular Hairstyles in History. Tagged mia farrow, pixie cut, vidal sassoon. A longhaired Mia Farrow began her career as the modest and intelligent Allison on ABC’s popular prime-time soap opera Peyton Place, where she was one of the most beloved characters. In 1965, Farrow shocked the series when she showed up for work one morning with all of her hair chopped off—forcing the writers to find a way to work the cut into her character’s storyline. Farrow’s haircut made waves again, in 1968, when she appeared in the horror film Rosemary’s Baby with a shorter pixie cut by Vidal Sassoon. The process of the cut was even photographed in a boxing ring and used as a publicity stunt to market the film. 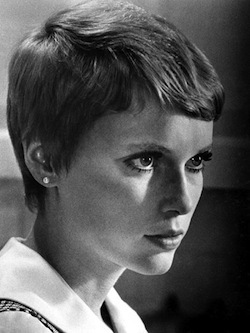 After viewing the film, many women went to their local salons to copy the Mia Farrow pixie, a sign of rebellion to the highly styled standard of the 1960s. Farrow later starred in the film The Great Gatsby, and appeared on the first cover of People. The pixie has made many comebacks on similarly waifish celebrities such as 1990s supermodels like Kate Moss. Victoria Beckham cut off her signature bob and caused a stir at a Marc Jacobs’ fashion show in 2008. Most recently, actresses Michelle Williams, Carey Mulligan, and Emma Watson graced red carpets with their pixies. Watson shed her locks to transition her career into more adult roles following the success of the Harry Potter films, proving the power of a pixie cut. Mia has stated in many interviews that she still cannot believe the commotion a haircut can create, but with a pixie like hers, the style is dramatic enough to turn heads even today.